Great landscaping is more than the pretty face of your home — it can be the first line of defense between you and natural disaster. Using pavers and gravel for your patio and planting low-growing plants along your foundation are two smart (and attractive!) ways to make your backyard more protected against fires. Gorgeous and well-cared-for landscaping can boost your home’s value by up to 28%, punch up curb appeal, and reduce energy bills. If you live where wildfires are a possibility, you should set up “fire defense zones” that make it easier for firefighters to put out blazes. Zone 1: This is the area within 30 feet of your house that gives firefighters room to fight a blaze. 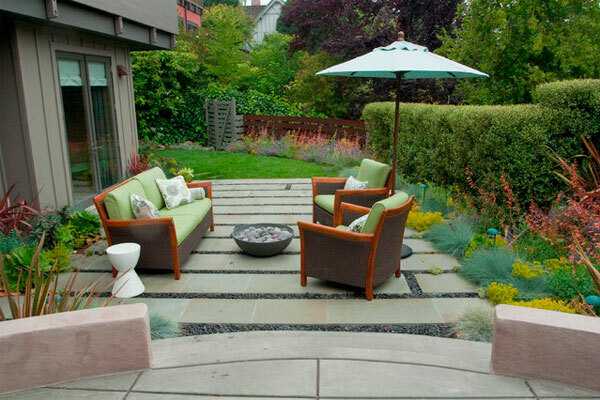 Put hardscaping — flagstone, gravel, pavers — in the first 4 feet out from your house. Then, plant low growing and less dense foundation shrubs, like azaleas. Keep trees away from your house. During a wildfire, if this 30-foot zone has burning shrubs and trees, firefighters may decide it’s not safe to stop, and just move on. Zone 2: This area extends a total of 100 feet from your home, more if your property is sloped. 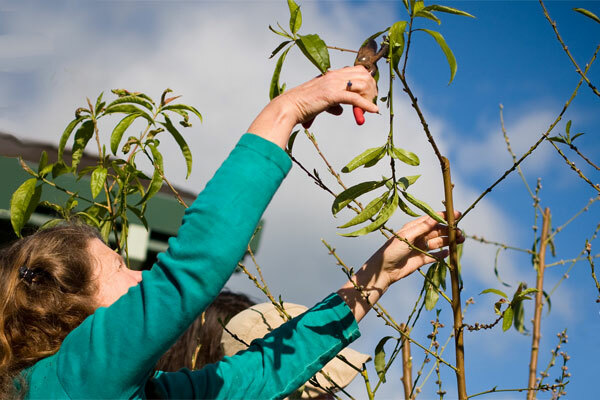 In this zone, trees and shrubs should be thinned out and opened up by removing branches close to the ground. Zone 2 is a good place to install wide paths, which act as firebreaks. A manicured lawn and well-maintained yard deprive flames of fuel. Keep grass short and irrigated. Clean up leaves, branches, and dead plants, which burn quickly. Remove weeds, especially those taller than 6 inches. No landscaping is fireproof. But some plants, grasses, and mulches fan the flames, while others are slower to burn, giving you more time to save your home. Avoid plants with stems that contain wax, terpenes, or oils, which are super flammable. Green fire fodder includes junipers, hollies, eucalyptus, and pines. If you use bark mulch, which is highly flammable, keep it moist. 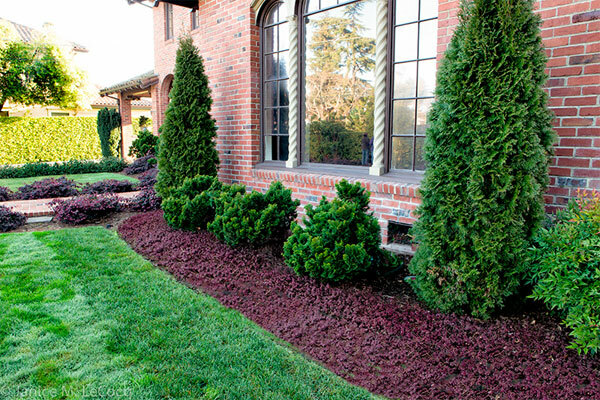 Less flammable mulches are gravel, decorative rock, or bark-and-rock combinations. Fire-resistant foundation plantings are azaleas, boxwoods, hydrangeas, and burning bushes (ironic, right?). Succulents, like sedum, have high water content and are less flammable. Landscaping windbreaks can help protect your home when Nature huffs and puffs and threatens to blow your house down. Windbreaks are trees or shrubs planted in strategic places to reduce wind speed and buffer your home against gale-force gusts. Windbreaks also lower heating costs by reducing the cooling effects of wind on your house. But to get your windbreak to work at peak performance you need to pick the right plants and plant them in the right place. The perfect trees and shrubs for a windbreak have low crowns that can slow wind speeds close to the ground. A mix of evergreens and deciduous trees (that lose foliage in winter) make the best windscreens. The best place to plant a windbreak is one or two tree heights away from your house, on the side where prevailing winds occur, according to the Arbor Day Foundation. The larger the tree, the farther you’ll plant it from the house — a safety measure in case it topples. Typically, the north and northwestern sides of a house are most likely to get winter’s chilly blasts. A well-landscaped yard slows the flow of water over the ground and helps prevent it from getting into the soils around your foundation, where it can damage foundation walls, or even leak into your basement. A mix of native (they are true survivors) plants, trees, and shrubs sends roots into the ground, which form spaces in the soil. Water seeps into these spaces, rather than pooling on your yard or soaking the soils around your foundation, which can cause foundation problems. Grasses: Their mat-like roots are extensive and great for soaking up rain and preventing erosion. Chose indigenous ornamental and turf grasses that are well adapted to your location and have a greater chance of surviving bad weather. Ground covers: Thirsty roots of these leafy spreaders, such as creeping Jenny (Convolvulus arvensis), drink rainwater and prevent erosion. Shrubs: These plants pack a 1-2-3 punch; they slow wind, absorb rain, and create curb appeal.